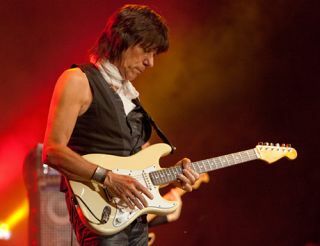 Jeff Beck, the World's Greatest Living Guitarist™ put on an intimate tribute concert on honour of the great Les Paul at New York's legendary Iridium Jazz Club where Les used to regularly perform right up until his passing in August 2009. Here's a snippet of some of the fun, which includes Brian Setzer jamming with Beck and his band. And who's that at the back singing his heart out? None other than UK Rockabilly maestro Darrel Higham, guitarist with Imelda May, who is currently on tour in the US with Mr. Beck. Darrel will be featured on the September issue of the Guitarist CD in an exclusive Eddie Cochran tribute during which he'll be lovingly caressing the lauded Gretsch G6120EC Eddie Cochran Tribute Model.